“The Spirit of the Sarode!” fundraising concert held by the Ali Akbar College of Music took place at the Marin Veteran’s Auditorium in San Rafael. 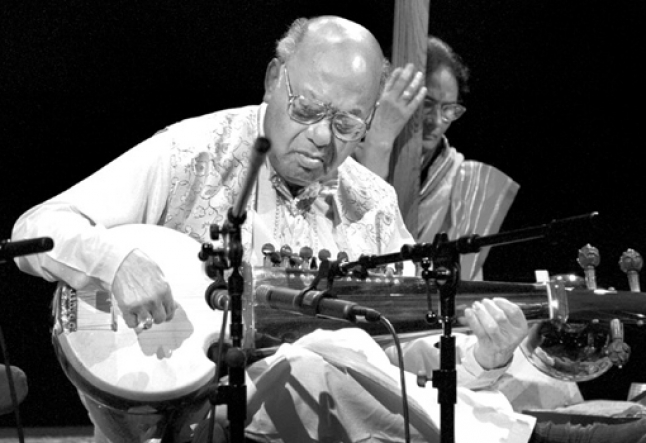 Ustad Ali Akbar Khan (Khansahib), who had been considered by many to be the world’s greatest sarode player, took center stage, flanked by two of his sons, Aashish Khan and Alam Khan (both on sarode), and accompanied by Pandit Swapan Chaudhuri on tabla. The majestic sarode is a 25-stringed lute from India, one of the most exotic instruments in the world today. “Everyone always asks me what to do when listening to Indian music and I always tell them this: Come and relax, the music will tell you what to do.” Khansahib’s parting words sink in before the musical odyssey begins. The rich, tonal sounds from the sarode infuse the auditorium with its powerful, hypnotic spell, stirring the emotions of joy and love, also known as sringar-rasa. Gradually, the room becomes completely absorbed by the magic of the sarode. The next day finds Khansahib at his music school in San Rafael, where he is teaching North Indian Classical music to a roomful of students with various instruments and ability levels. At 83 years of age, he is the embodiment of steadfast devotion to his art. Khansahib opened the doors to the California branch of The Ali Akbar College of Music 38 years ago. Today the school is still strong. Following class, I sat down with Khasahib at his residence, in a room filled with hundreds of images of goddesses, saints and deities from all religions. Khansahib points out that everyone is included here. YT: Can you talk about the transformational effects of your music? Ali Akbar Khansahib: Brahma created the six ragas, ragas being masculine in nature. These were taught to Shiva. Shiva learned these and then created six raginis, the feminine form of a raga, for each of the six ragas, bringing 36 main ragas into being. There are 75,000 kinds of ragas. These ragas were created in heaven. There are nine main moods, or juices, known as rasa. The nine rasas are Sringar (joy and divine love), Karuna (compassion and pathos), Bhakti (devotion), Wir (heroism, courage and valor), Hasya (dignified laughter and merriment), Shanta (peace and restfulness), Ghambhir (seriousness and solemnity), Chanchal (playfulness and restlessness), Tiyag (detachment, renunciation and sacrifice), and a tenth, Chamatkar (surprise, wonder, marvelousness). Each of the ragas, or melodies, has a different rasa associated with it. In this way, the raga brings about a certain mood quality in your being. YT: Do you choose the raga before the concert or in the moment? Khansahib: The raga is selected according to time. Every two hours of the day, from sunrise to sunset, sunset to sunrise, the melody changes. There are also seasonal ragas, and in India, we have six seasons. We play a specific raga in synchronicity with the rain, to grow fruits and dates. God created this. For example, in the early morning, just as you do not eat chicken and you eat something gentle for your digestion, you have a certain melody that is in sync with the energies of that time of day. YT: Can you talk more about the healing benefits of Indian Classical Music? Khansahib: Listening to Indian Classical Music is the best way to make your soul healthy. In the old days, Kings would pay for the very best musicians to play ragas all day for their health. This was an alternate way of healing without medication. When the correct ragas are played at the corresponding time of day, they are very healing to the body, mind and soul. Just like you mix certain leaves and fruits to create a medicinal concoction, timely listening of specific ragas is a healing concoction. What you put into your body to eat makes you strong. What do you give your soul to be strong? What you feed your eyes, your ears and your nose are just as important as the food you eat. Many people eat without tasting the food. There is no benefit with this. Much of the music of today is making us crazy. The enjoyment is artificial. If you truly enjoy something, the after-effect is strong.